Guidelines of Withdraw Non utilized Finger Print devices from AP Schools as per Rc. No. 58/ITcell (PMU)2016 Dated: 27/11/2018. AP పని చేయని ఫింగర్ ప్రింట్ డివైజెస్ ఉపసంహరణ పై ఉత్తర్వు మార్గదర్శకాలు. All the Regional Joint Director of School Education and District Educational 0fficers in that state are Informed that the Department of good Education. Govt. of Andhra Pradesh is implementing tile Aadhaar Enabled Biometric Attendance System\ AEBA5) at various schools in the State through IRIS tabs and Finger Print Devices. Further, the District Nodal Persons (ehazar) are instructed to collect the SIM cards inserted in those devices and same should be handed over to State Nodal Person (Ch V 5 Ramesh Kumar, O/o CSE) immediately for onward deactivation. The entire exercise should be completed by 30th Nov 2018 and submit the compliance report to the undersigned. The information on the devises handed over shall be uploaded on the CSE portal in the concerned MEO / Dy EO logins. Therefore, all the District Educational Officers in the state are instructed to take necessary steps to complete the above exercise and complete the rationalization of devices within the district to obtain 100% teachers attendance. బయోమెట్రిక్ డివైజెస్ పై తాజా ఉత్తర్వులు విడుదల. పనిచేయని ఫింగర్ ప్రింట్ డివైజెస్ ఉపసమ్హరణ పై ఉత్తర్వు మార్గదర్శకాలు విడుదల అన్ని పాఠశాలలకు తెలపాలని ఆదేసాలు జిల్లా విద్యా శాఖ తక్షణ చర్యలు చేపట్టాలని ఆదేశాలు. పాడైన డివైజులను తిరిగి వెనిక్కి ఇవ్వాలి. రాష్ట్రంలో పనిచేయని పాడైన డివైజులు 200000. వీటిని సిమ్ కార్డ్లులు తో పాటు కో ఆర్డి నేటర్ల కు ముట్టచెప్పాలి.ఈనెల 30లోపు ప్రక్రియ పూర్తి చేయాలి అని ఆదేశాలు. Sub: School Education Department implementation of e-Hazar Updation of RD Services in Finger Printer Devices- Withdraw the Non utilized Finger Print devices from schools Reg. 2. Letter Rc.No. 58/IT Cel/ 2016, Dt 10 09/2016 of this office addressed to UIDAI. 3. Letter even No. dated 20-11-2018 addressed the M/s Karvy Datia Management Services Ltd.
All the Regional Joint Director of School Education and District Educational Officers in that state are informed that the Department of School Education, Govt. of Andhra Pradesh is implementing the Aadhaar Enabled Biometric Attendance System (AEBAS) at venous schools in the State through IRIS tabs and Finger Print Devices. Further, M/s Karvy vide reference 2nd cited above informed that out of the 37,000 devices supplied, 20,000 devices are dysfunctional as per the recent mandates given by UIDAl (Updation of RD services). Due to which authentication and capturing of attendance of Basing on the above, Mantra devses being used by School Education Department from compliance to the UIDAI orders cited 2nd above and to permit the department to continue to utilize the Mantra devises still more compliant devises are deployed. So far such an exemption orders are awaited from UIDA. In view of the above, necessary instructions were issued to the M/s. Karvy Dala anagement Systems to with draw 20000 dysfunctional devices from the schoob vide in the reference 3rd cited. In this connection, all the District Educational Officers in the state are instructed to issue instructions to all the Head of the institutions and District Mandel Nodal persons o e-Hazar to withdraw the Karvy Mantra devises not begins utilized since August-2018 only and hand over the same to Karvy coordinator duly registering the acknowledgement. 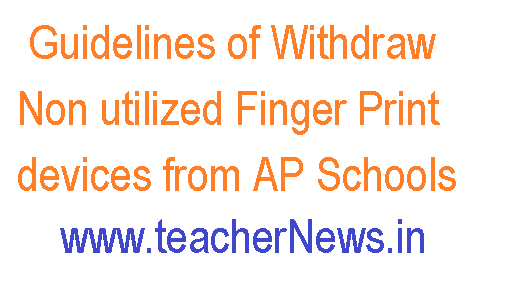 Guidelines of Withdraw Non utilized Finger Print devices from AP Schools .AP పని చేయని ఫింగర్ ప్రింట్ డివైజెస్ ఉపసంహరణ పై ఉత్తర్వు మార్గదర్శకాలు Download.